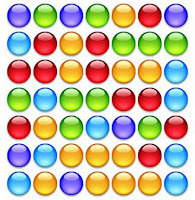 To play the game simply double-click or double-tap on any set of 2 or more balls of the same color that are touching. The balls will disappear and any balls above or to the left of the balls you just eliminated will shift into new positions. The goal is to clear all the balls from the screen. If you want to play this on your computer I'm imagining you may need Safari ?